Toyotas next president, Akio Toyoda, center, clasps hands with outgoing President Katsuaki Watanabe, left, and Chairman Fujio Cho after the announcement that Toyoda would take over in June. Compared to previous Toyota presidents, Akio Toyoda has an unusual background.  He attended school in America and worked here.  He worked in the increasingly important China market.  He is known for challenging old-guard conservatism. TOKYO — Akio Toyoda, scion of Toyota Motor Corp.'s founding family and its next president, will bring fresh thinking and a U.S. perspective to the world's top carmaker as it fights an unprecedented financial crisis. Toyoda will succeed Katsuaki Watanabe in June, the company said last week, ending weeks of speculation. Toyoda, an executive vice president since 2005, will be 53 when he takes the helm, making him the youngest president in the company's history. The Toyoda heir will inject an international outlook into a company with overseas operations, including in the United States, that now account for most of its sales and are contributing to the first operating loss in 70 years. "Innovative and youthful ideas will be required," Toyota Chairman Fujio Cho said at a hastily called press conference to announce the change. "We need a new generation to make bold change and reform." Indeed, today's Toyota would be unrecognizable to Akio Toyoda's grandfather, Kiichiro, who founded the automaker in 1937, or his father, Shoichiro, president from 1981 to 1992. Most of the company's history has been a march of progress. But now Toyota is slashing production, cutting jobs and reeling from tumbling sales amid a global financial crisis. The company says it will post an operating loss for the fiscal year that ends March 31. North America accounts for a third of Toyota's worldwide revenue. U.S. sales fell 15.4 percent to 2.2 million vehicles last year. Separately last week, the world's largest carmaker announced that global sales dropped 4 percent to 9.0 million units in 2008. "We are now faced with unprecedented difficulties that come along only once in a hundred years," Akio Toyoda told reporters. "I need to focus on the rapidly changing environment." Toyoda's international portfolio includes stints heading Toyota's China and Asian operations and as a vice president of New United Motor Manufacturing Inc., the Toyota-General Motors joint venture in Fremont, Calif. Last summer he was put in charge of all overseas business. Toyoda is grounded in U.S. business practices, customs and finances. Like Edsel Ford II, Toyoda graduated from Babson College in Massachusetts, a school specializing in educating children of business leaders. After graduating in 1983, he worked at a New York investment bank. Toyoda has a track record of pushing through unpopular decisions. Long before "e-commerce" was a buzzword, Akio Toyoda pioneered Toyota's online business initiatives — against stiff opposition from the executive floor. Denied a budget for his ideas, he used his own money to start Gazoo.com in Japan. It blossomed into an online referral service, offering basic information to shoppers about car features, sticker prices and finance plans. Yet the real success rested on its evolution into an online shopping mall where people can buy everything from music CDs to bean paste. By building relationships with consumers, Toyota hopes they will return to Gazoo to buy a car. Then Gazoo directs them to a Toyota dealer. 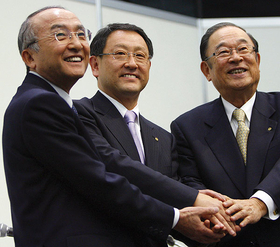 Akio Toyoda will be the first Toyoda to become president since 1995, when his uncle Tatsuro Toyoda stepped down. The Toyoda family owns only 2 percent of the company's stock but benefits from a hard-to-measure extra clout that the Jap-anese call "plus alpha." At the press conference, Akio Toyoda called his father, the company's honorary chairman, a "flag" around which the company traditionally has rallied. "I am not yet that flag, but I intend to do my best so that maybe 20 or 30 years from now, people may look back and refer to me as a flag," he said. While few doubt Akio Toyoda's talent, many suggest he is too young. Some expected Toyota would appoint an elder caretaker president to give the scion more on-the-job training. Toyoda's appointment must be approved at a June board meeting, and Watanabe then will become vice chairman. But risks of the reshuffle aren't lost on the home audience. Before the company's official announcement, Japan's Yomiuri newspaper pondered Akio Toyoda's new role, saying, "Toyota gambles on founding family's prestige."